Like all children, my daughter has grown up. Now, we’re always sorting out closets, deciding what can stay, what should go, reminiscing all the while. 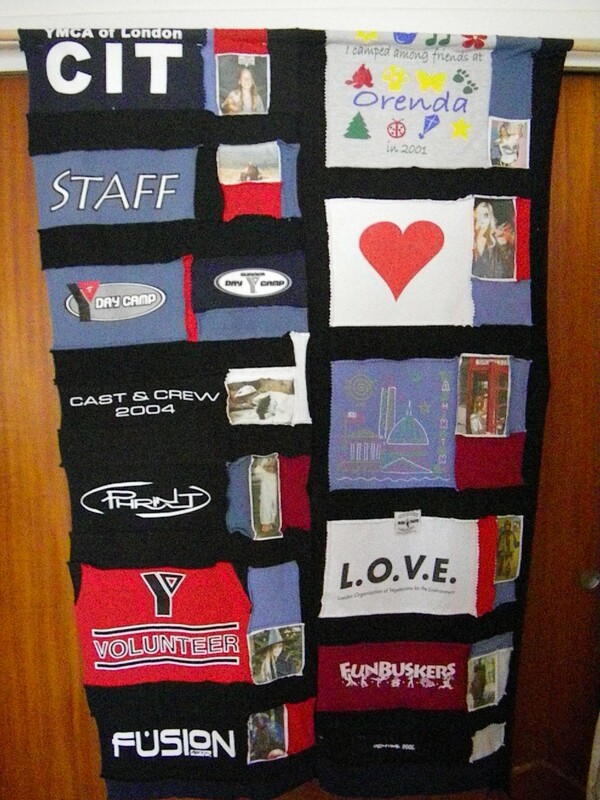 She came up the idea for me to make a blanket from some of her favourite and well-loved t-shirts. I’ve made traditional quilts, and crazy quilts from blue jeans, but never worked with knits before. Joyce’s Sewing Shop on Wortley Road had a beautiful four-way stretch fleece that looked like shearling, so I didn’t worry about stabilizing the blanket. Planning the blanket was a challenge. The t-shirts and their logos were different sizes. 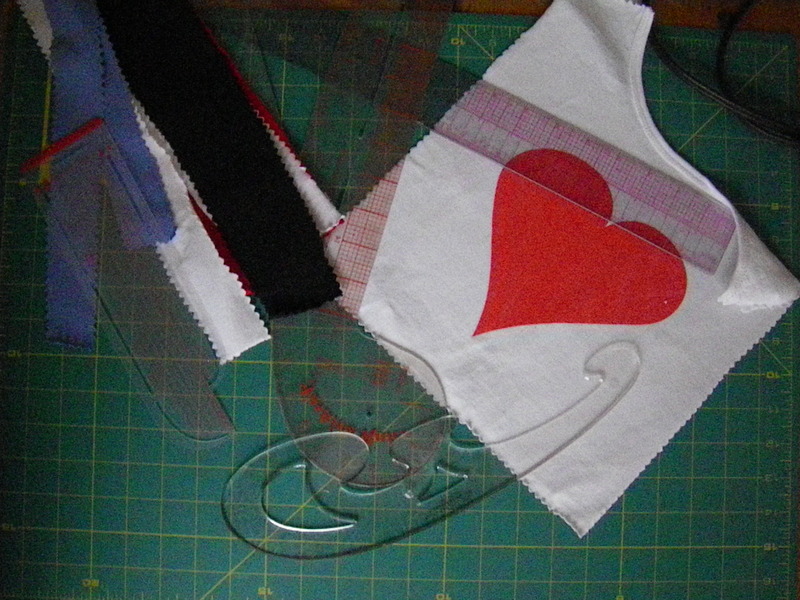 So I approached it by cutting first, planning later. The logos were cut out with generous borders and to get a sense of how to put them together, I laid them out on the table. Nothing matched up. 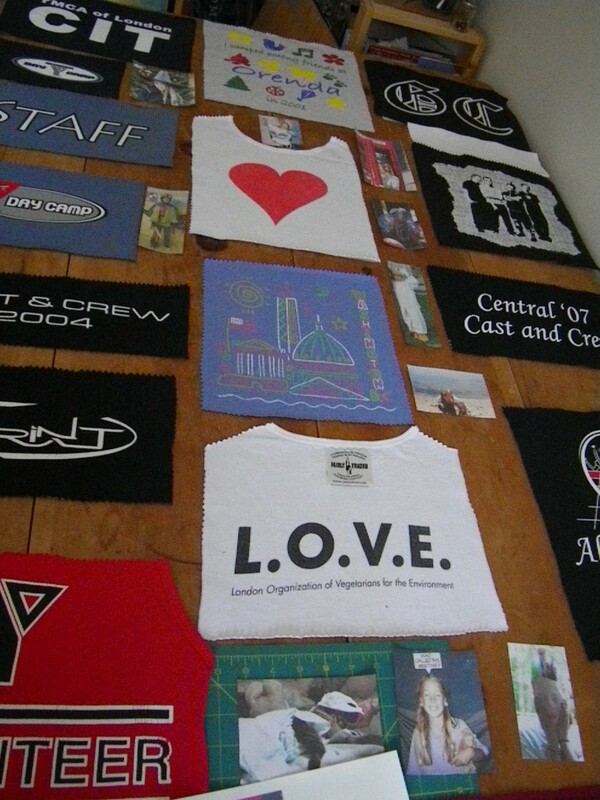 In the end, I decided to make four rows and fill in the spaces with extra t-shirt fabric AND old photos! I didn’t tell my daughter about the photos. The design was kept to rectangular and square shapes, and because I wasn’t going to be fussy about squaring the corners and a consistent grid, I sewed the top so the selvedges were showing. 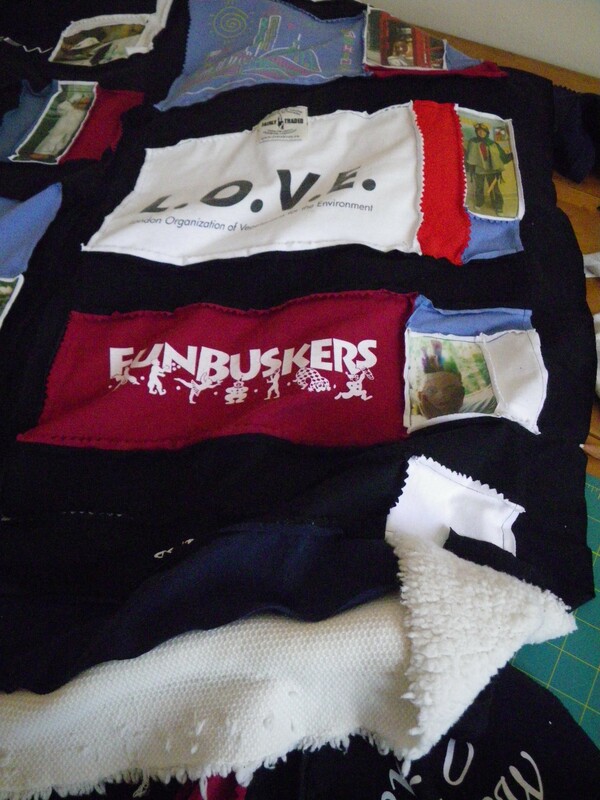 I figure after a number of washings, there will be a nice rag look to the borders of each piece. Because of the thickness of the fleece, I didn’t put a layer in between top and backing. I finished it by tying it at regular intervals so the blankie could stretch without tearing. If I’d stabilized it, the folks at Joyce’s could have quilted by machine for me. And my grown girl loves it! !